Here is a cat pendant to wear with your favorite chain. 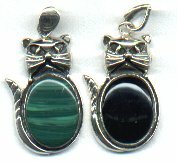 The cat pendant is made of sterling silver and the cat body is either malachite (green) or onyx (black). 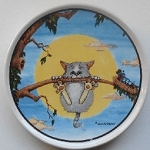 The cat pendant is 1 1/8" high x 5/8" wide. Choose your favorite style.